Julie informed us last week that she and Adam were planning to enjoy the Room Escape Adventures latest production, “Trapped in a room with a zombie,” and she invited us to join them. Angela and I quickly agreed, and at the last minute today Jonah opted to join us. 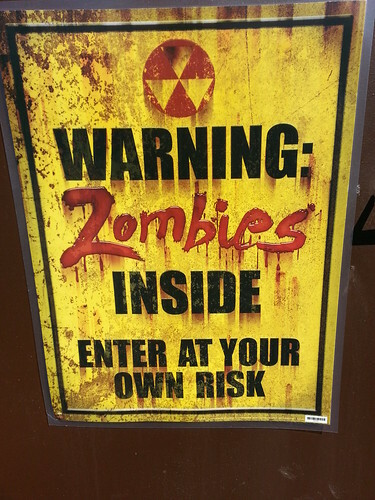 We arrived at a run-down industrial facility near downtown Columbus, and opened the door marked “Warning: Zombies Inside”. We entered what appeared to be an abandoned warehouse, with a hastily constructed room standing to one side. This room was clearly the object of our event. Aside from this room, there was also a bathroom in a serious state of disrepair. The toilet kept running, and the sink leaked terribly. I don’t know if any of this was by design, but it certainly did add to the ambiance of the experience. Aside from us participants, there was a friendly young woman waiting for us. She explained the rules, and oversaw our entry into the room. She answered a few general questions about the setup, and was very pleasant. She pointed out that the success rate at our location was a dismal 31%. The rules were simple. Solve puzzles; don’t mess with the zombie; and don’t mess with the furniture. If the zombie touched you, you were out, and had to stand at the back of the room. Such players could no longer physically interact with the game environment. They could still talk, and strategize with their teammates, but they couldn’t manipulate items within the room. None of us really knew what to expect. We knew that there would be puzzle solving. And we knew that the zombie would get greater access throughout the room as time went on. We didn’t know what the room layout would be, or what kind of puzzles we’d face, or how scary the zombie would be. We all felt pretty confident in our abilities: many of us enjoy puzzle solving, and we felt that we had a pretty strong plan of attack for coordinating our efforts. Then we entered the room. 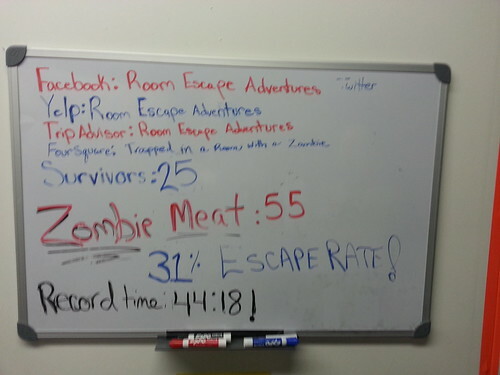 Sixty minutes later, the timer ran out and the zombie devoured us. I won’t say more about this, because I don’t want to spoil the experience for anyone. I will heartily recommend this experience to anyone with an interest in puzzles and zombies. It was a very engaging experience, and we all had an awful lot of fun. It was mentally and physically taxing. And even though we lost, we all left with huge smiles on our faces.